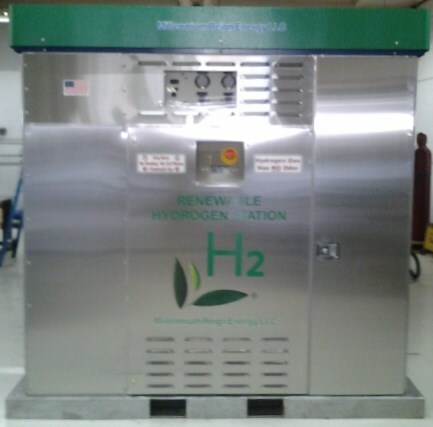 Affordable Scalable Hydrogen Infrastructure; Look for the Green Banner !! Millennium Reign Energy LLC’s proprietary product, the AutoARK® is a fully automated hydrogen generator created to a scale for residential, small business, telecom and farm applications or fueling stations like our SHFA ( Scalable Hydrogen Fueling Appliance ) Models 100, 200 and 300. These products have recently received a Certificate of Attestation to CSA Groups IR 3-18 for Hydrogen fueling Appliances and CSA IR 4-14 for Electrolyzers. These products can display the CSA Mark as they have passed CSA Group’s third party laboratory testing and meets the necessary codes and standards to be safely deployed. The products are Patented in the USA, Canada and the EU and trademarks have been issued on the green banner and the H2 with the 3 leaves logo. MRE’s Electrolyzers are built with efficiency in mind. Our stacks average using 48 kilowatt hours to make 1 kilogram of hydrogen or about 423 standard cubic feet. Our systems can then use waste heat for assisting in heating a home as a by-product of hydrogen production, which further increases efficiency. This greatly enhances affordability of on site production of hydrogen. Focus has been placed on safety first with affordability and ease of operation for the owner. 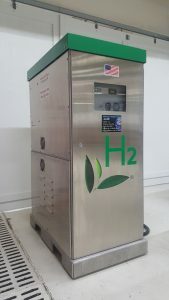 A unique and inexpensive Patented membrane has been employed to keep the hydrogen separated from the oxygen. Proper valves are opened or closed by automation and captured hydrogen is purged into a larger tank for more permanent storage. The oxygen is purged into the environment or into a building to improve air quality. 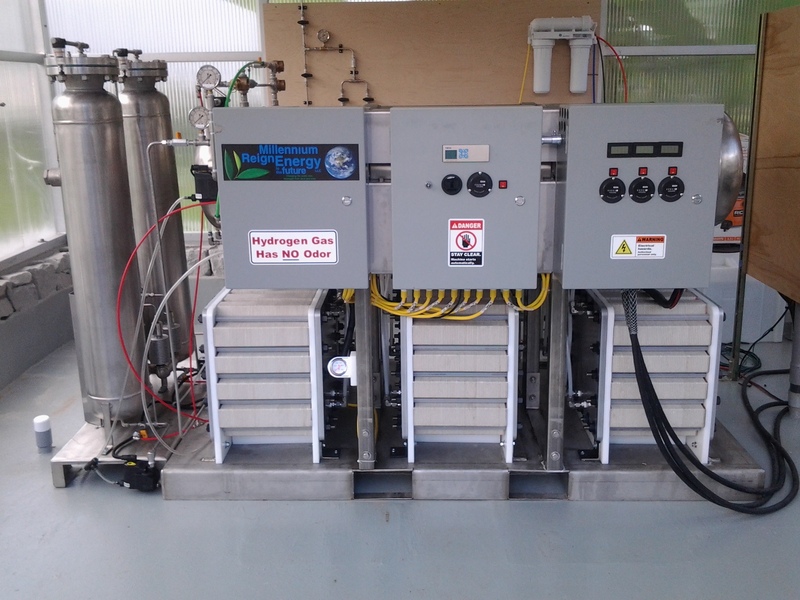 Our SHFA Models 100,102,104, 200 and Model 300 shown to the right, all incorporate our Patented Electrolyzers into the system. The SHFA’s combine Hydrogen generation, purification, Compression, storage and dispensing all inside ventilated stainless steel Enclosures. All systems have been fully automated for ease of operation, including safety features with many fail-safe features which have been incorporated to allow for safe use by an inexperienced consumer. 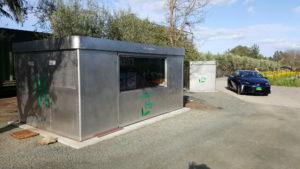 Production models are currently operating on both 240 volt and 120 volt line voltages and the AutoARK® also will run on wind and solar through the renewable source’s inverters. Scalability is a key advantage to our product lines. 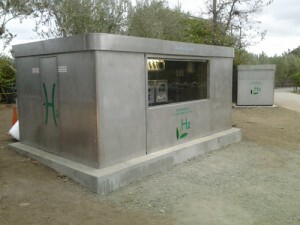 MRE has multiple levels of products producing different volume levels of hydrogen per day. The Electrolyzers are scaled in cell numbers of 11, 27, 55, 114 and our best selling system is our model 330 TT for (Triple Twin) soon to become a 342 TT. 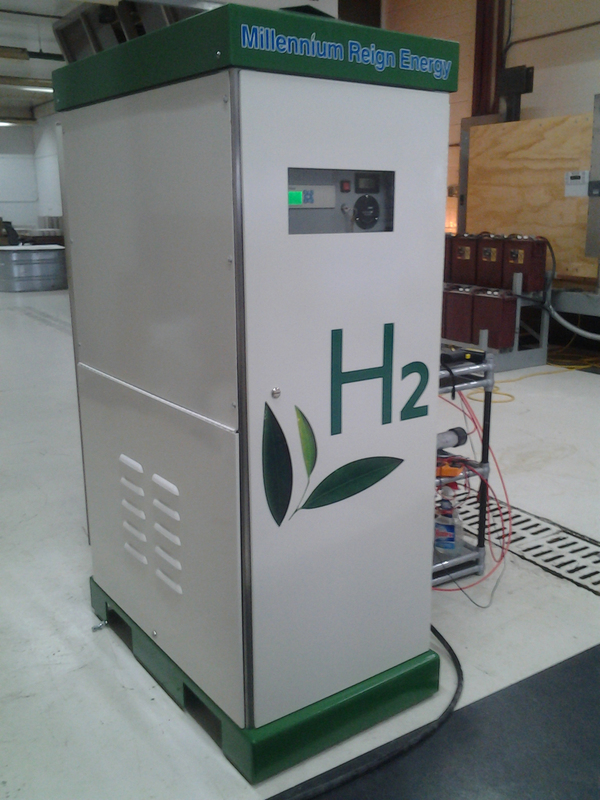 The hydrogen production range on the product line is currently from 6.5 scfh up to 200 scfh or 12 kilograms per day. This wide range allows for more proper size matching to your needs and saves money by not buying a bigger system than you need.